Young up-and-coming author Liz McKinnen has no idea that her life is about to change forever when she comes home from her first book tour. When she's kidnapped and told by her captors that she has to kill her fantasy book's antagonist, she thinks that she's fallen into the hands of crazy, dangerous fans... until her antagonist sends a real, fire-breathing dragon after her. 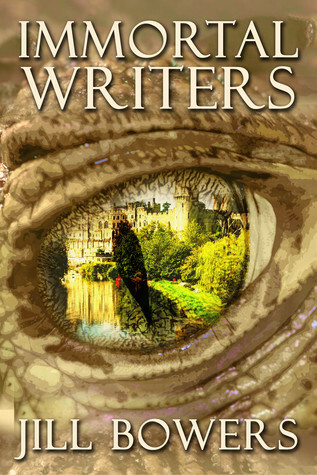 Liz is quickly initiated into the Immortal Writers, a group of authors from throughout time whose words have given them eternal life, and whose prose is so powerful that it's brought stories over from the Imagination Field into the Reality Field. As Liz meets authors such as William Shakespeare, JRR Tolkien, Edgar Allan Poe, and Jane Austen, she has to learn how to control magic, fight dragons, and face her own troubled past before her power-hungry villain takes over the world. Will she survive the ultimate battle against the dragon lord whom she created? Its been a very long time since any book that I came across had impressed me to this extent. While going by the Title it doesn't give much of the fantasy effect that the story has, hence when I started reading this I had assumed it to be another fantasy with the chosen one and same plot line with a new batch of mythical creatures. But nah! This book proved me wrong. I totally loved the idea of being an Immortal writer and crafting out worlds that somehow mix with reality. I loved the way author brought the whole concept of literature and empowering words into fantasy. This book was totally unexpected in terms of central idea. But as we progressed through the book. Sadly, it turned into fantasy cliche again, yet loads of action, drama covered up for it and made the reading experience pleasant. I wish there had been more exploring and work around with the idea of being an Immortal writer. The story just introduced the concept of Immortal Writer and then dived into your usual fantasy story where a chosen one has to fight through the obstacles and kill the antagonist. When we talk about character development, it was one of the weak sectors here. For example, I totally loved the idea of Shakespeare being one of the characters inside the book realm where as there was a lack of his character development. Even on the part of Curtis and Healer or Rob, most of the time the book was around Liz aka the main character. We never really got to know the other characters much. But If I mix the entire thing up and then view it as one whole book, one or the other flaws get compensated and it makes a good read. The narration is good, I enjoyed the narration on the third person POV, but felt it could've been much more effective if it had been 1st person POV since most of the time the story revolved around Liz. I really enjoyed the complexity around the plot as at first it gave you the concept of the world of Immortal writers and then it dived into Liz's created world. Like a world within a world fantasy realm probably, certainly quite an complex idea. If you are a fantasy lover and are tired of cliched fantasy novels about vampires, werewolves and wizards then this one might be a really good read for you. If you are new around here then do click here to subscribe to blog updates!